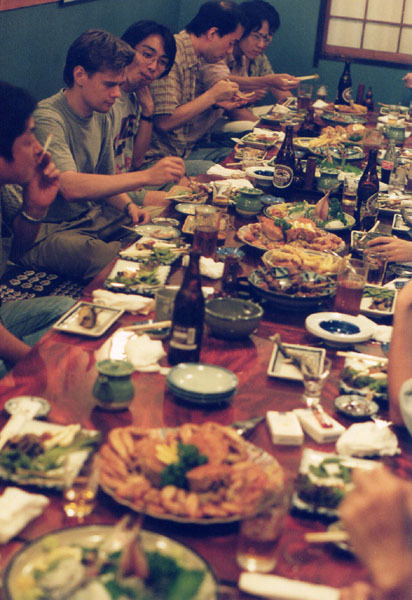 In the Japanese culture the meaning of working as a group is known to be extremely important. Generally it could be said that no decisions are being made individually, everything is being negotiated between all the people involved the given matter. Concerning a production of an animation movie it's obvious that the process itself requires seamless team-work. Even in the pre-production phase a lot of time has to be spent for brainstorming as a group. For obvious reasons many anime movies are also based on some manga already excisting, such as Akira and Ghost In The Shell (Kokaku Kidotai). When the synopsis is ready ( And even before that ), the characters of the movie are being drawn into detailed character designs, of which the animators use for reference in their work. Similar detailed drawings are being made of the environments. The designs of Jin-Roh also included detailed visual representations of the characters, their clothing, vehicles, weaponry and other objects from different angles. The production itself begins with the making of the storyboard which is, especially when it comes to full-length anime movies, often made by the director of the movie. 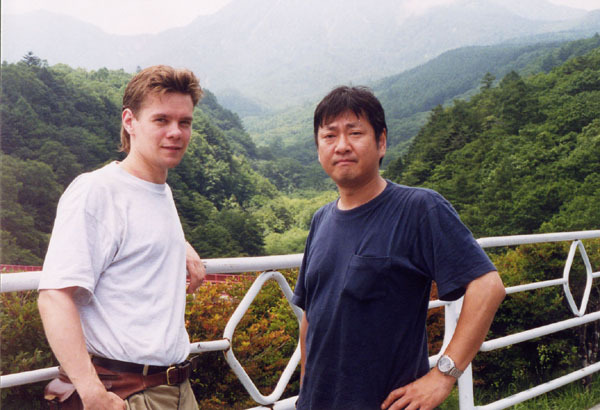 This was also the case in Jin-Roh, of which storyboard was made by its director Hiroyuki Okiura. Also Blood's storyboard was drawn by H. Kitakubo who also directed the movie. The storyboard is either drawn directly to a A4-sized paper (Jin-Roh), or as bigger pictures that has to be copied later into a smaller size. This is what was done during the production of Blood, where the IG:s production coordinator Arata Iwashina eventually assembled the drawings of director Kitakubo into the final storyboard. In the storyboard are usually being marked the shot numbers (shot), camera movements such as zoom in and out ( T.U.=track in, T.B.=Track back), pans (Pan), the dialogue and the duration of the shots as seconds and frames. When the storyboard and the designs of the environments and characters are ready, the director and the key-animator(s) can start drawing the lay-outs. At this point the director is mostly making decisions about the compositions and angles. In the lay-out the sketch of the storyboard is being drawn to the final size, referring to the designs made of the characters and surroundings, combining those two into one picture. On the same background can be drawn characters in different stages of the animation sequence, as long as it doesn't make the lay-out too confusing. In the making of the Blood lay-outs digital software such as Photoshop was used extencively. 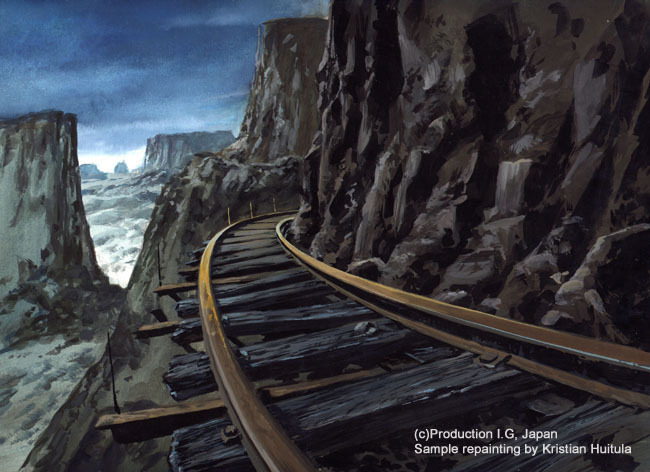 The rough background paintings were scanned, then after making all the needed corrections the characters were added. 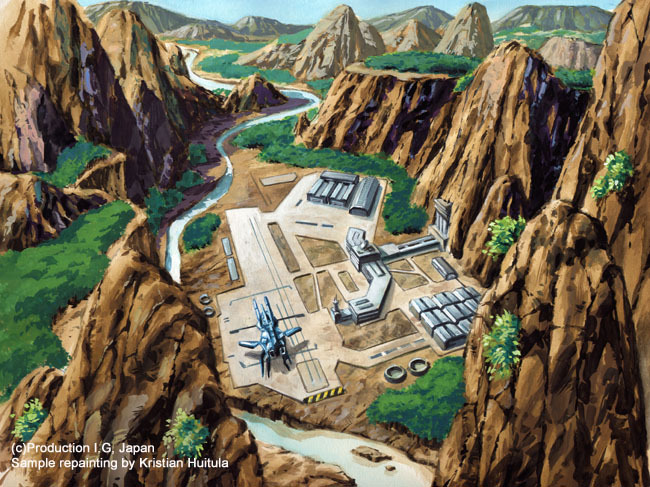 After getting the finished lay-out the art director (Hiromasa Ogura) uses it as a reference when making the background painting with his assistants. 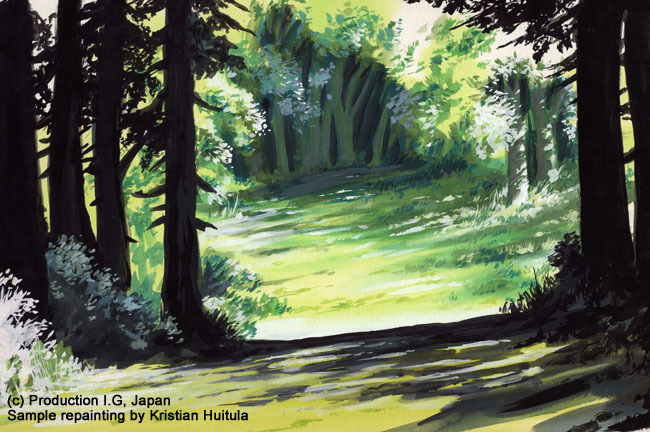 H.Ogura usually begins with first making color sketches of certain significant points of the animation, before making the final background paintings. Even after finishing the final BG-paintings they might have to be re-painted, if for example the angle or the colors has been decited to change. Obviously when applying computer graphics such alterations are much easier to get done. The use of 3D-graphics also gives more variety and freedom about the use of angles and "camera" movements when it comes to the use of perspective. BG-painting versions by Huitula. Original paintings copyright: Production I.G. Using the storyboard and the lay-outs the key-animators start drawing the key-frames (genga). The durations of the shots marked on the storyboard can still be changed if necessary. On a bigger project there can be even 30 key-animators. They finally decide the duration of a certain animation sequense they are working on, marking the key-frames on the list as a circled number. (A number inside a triangle marks for a suggestion of the key-animator). On the shot-list the key-animator makes a mark for all the needed in-between drawings (douga). The amount of in-between drawings varies extensively, depending on the nature and characteristics of the scene and the intentions of the key-animator. In the making of Jin-Roh also a natural sized custom-made warrior armor (see picture) was used for reference, as well as smaller models. In general, especially when it comes to Japanese TV-anime, the animation is performed with 2:s, one drawing lasting for two frames. (12 drawings /second). Sometimes the animation is carried out with 1:s and sometimes even with 3:s, and an animation can consist of all those, depending on the animation sequense and the motives of the key-animator. For example K.Kise is used to animating only with 3:s.
Since the amount of key-animators on a project can be vast, all the key-frames has to be checked and approved to maintain an even style. Usually there is only one person responsible for this checking in a given project. However, for example in Jin-Roh the corrections have been executed by the director Hiroyuki Okiura and the key-animators T.Inoue and K.ise. The key-frames are being drawn using relatively soft 2B-pencils and colored pencils are used to indicate for example shadows (blue) and highlights (red). The animators are also able to check their sequences with a Quick Action Recorder in the backroom, which however is quite rare due to the tight schedules. The in-betweeners proceed from there by making the missing drawings (douga) between the key-frames. It depends on the case how big part of the sequense the key-animator draws himself. Obviously this is also determined by the personal interests and skills of the key-animator. For example in Jin-Roh all the wolf scenes were drawn by one animator specialiced in animating animals. It's the in-betweeners who also make the clean-ups using a key-frame and a correction drawing. (The correction usually on a yellow paper). The in-betweeners work rapidly on several projects at the same time. (At the given moment Akihabara (FF), Kureon Shinchan (TV)). Part of the animation can also be executed in other companies if necessary. In-betweeners working at the animation department. The in-betweeners are usually freelancers who are paid by the amount of finished drawings, therefore to maintain a sufficient standard of living many work more or less around the clock. The average age of the employees seems to be from 20 to 30 years and only very few has worked at the department for more than a couple of years. 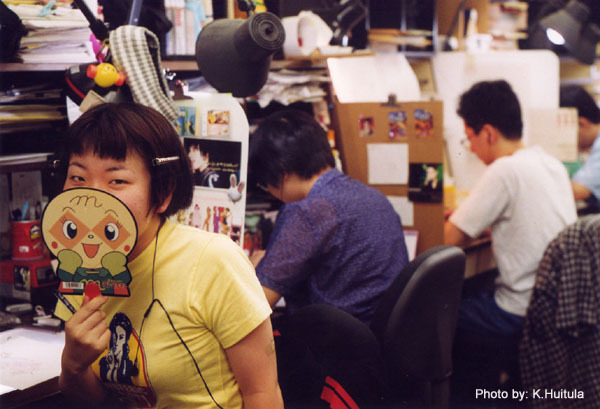 Of the most experienced workers of the department Koyama has worked at I.G for 8 years and Inoue in the animation field for about twenty years alltogether. In larger productions there can be working more than 100 in-betweeners. The payment from projects aimed for theatrical distribution is most often bigger than from projects for TV- and videomarket, because of the extremely tight schedules and budgets. One drawing is paid 120-200 yen for TV- and video-animation, whereas the payment for one drawing for a theatrical animation project can vary up to 400 yen (3,5 euros). Therefore a fast animator will be able to earn a reasonable salary even considering the high price-level of Tokyo. Surprisingly even in -99 some of the animation in Production I.G is done as a traditional cel-animation. Then the cels end up to the studio 7, where they are being colored by hand. In Japanese anime there are usually 350 colors, TV- and video -anime containing only 80-120 colors. Then again, in full-length theater-distributed animation movies even 500 colors may be used. Painting the cels is however a relatively slow process and thus expencive. Especially in summer during the rainy season the paint-jars can become mouldy very easily. This phase of the production process is also paid less and the department consists of mostly women. The digital production environment getting stronger also in Production I.G this line of work is becoming history, and soon after my visit the whole studio 7 is shut down. The filming of the animation cels, the sound production such as foleys, music, sound effects and dialogue are usually been done in separate production companies outside the animation production company. For financial reasons usually the dialogue voice-overs are being recorded only afterfards when the animation itself is already finished. In ING-Corporation's subsidiary company Xebec is located the company's only sound production unit, a Pro Tools provided by Bandai Visual. However its use is limited and is mostly used just for creating game sound effects. However, in the spring 2000 I get a chance to be initiated into anime post-production in a company called Omnibus promotion Inc. The company is specialized in the post-production phase of anime procuction, sound-production including foleys, ambience, dialogue, special effects and the sound design and final mix-down. In the spring 2000 the company is making the sound design for the full-length anime movie Escaflowne (movie adaptation). The foleys and dialogue has already been recorded earlier, and the sound processing and mix-down is in progress at Tokyo TV Center's studio 407 in Hamacho, Tokyo. A big movie screen is in use and Pro Tools is used for the soundprocessing and editing. The production of the movie is behind the schedule and therefore only a rough production copy of the movie is available. Only a part of the animation is in its final form, while part is just black and white line-art. Partly what you see on the screen is just the most important points of the animated movements, occasionally just attached pieces of paper. Trying to make the sound design process a bit easier in the given situation, for example pieces of paper has been attached in the animation to express the length of dialogues, footstep hits and certain special effects such as explosions. The orchestrated music has also been recorded already, so that the work can be mostly focused on the final sound design itself. Kazuki Akane, the director of the movie, is also present at the studio and supervises the sound design process. The sound design process itself is being conducted by Toshiki Kameyama from Omnibus Promotion Inc. Usually the amount of time used for the sound production phase of a full-length animation movie is around one month only. In Escaflowne the special effects are provided by a different company, Sound Box. I was the most delighted about the warm way I was welcomed to this society. Since day one I experienced an extremely creative environment. I was obviously very enthusiastic to meet the very pros of the anime industry. However, instead of meeting just pros, I was able to meet very warmhearted people who, without any hesitations, welcomed a foreigner from the other side of the world and were willing to share their tricks of the trade. Now, being able to see the whole anime production process from start to finish, I can say that I was able to learn something new and inspiring. It's obvious that the Japanese way of thinking strongly differs from the western one, in so many ways. The visual culture is different and the way to express emotions. In Japanese animation you can see it very clearly. Still there is so much about it that is universal. After all emotions are universal, in spite of the culture behind them. And no matter what artform, after all it's basicly all about emotions. And as we know, a good animation is able to affect emotions in a very srong way. Studio Ogura on a weekend trip at Yatsugatage. With my great mentor Ogura-sensei. 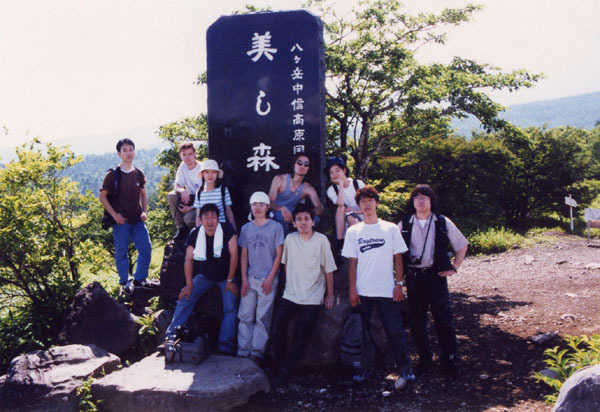 Ogura-studio's weekend trip to Yatsugatage. Sushi and sashimi all mixed up. 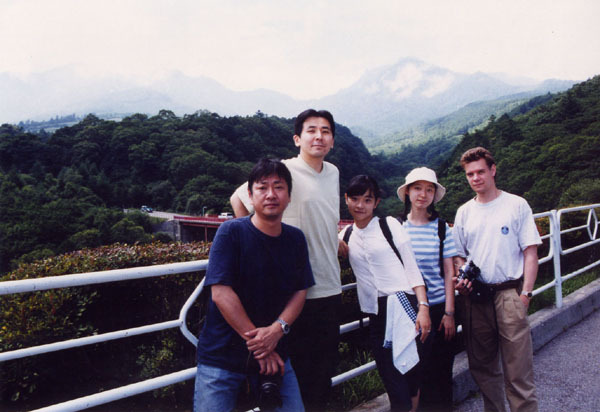 Hiromasa Ogura, me, Arata Iwashina, Toshiyuki Inoue and Kamiyama.